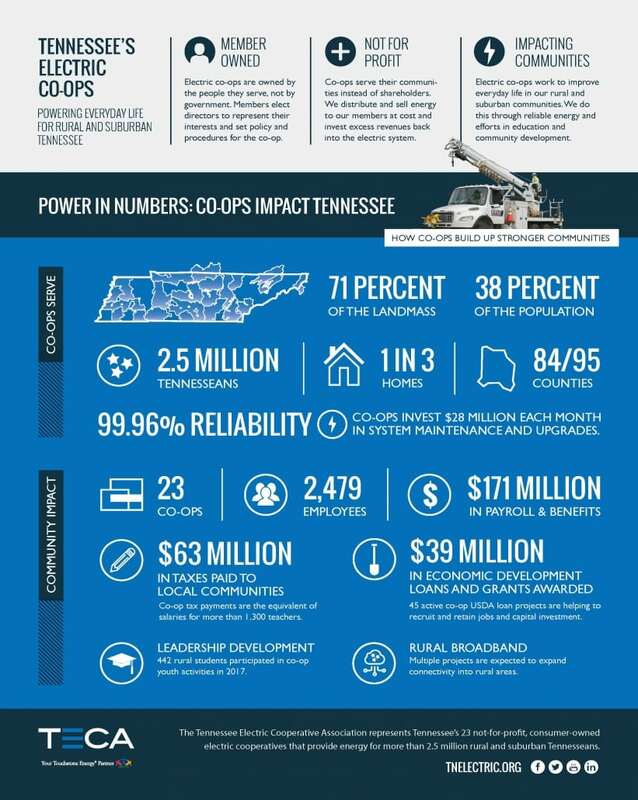 Electric cooperatives are private, consumer-owned, not-for-profit utilities that serve more than 2.5 million Tennesseans across 71 percent of the state’s landmass. There are 23 electric co-ops in Tennessee. Electric co-ops are owned by the members we serve. Members elect board members to represent their interests and set policy and procedures for the co-op. Co-ops exist to serve our communities instead of shareholders. Co-ops distribute and sell affordable energy and invest any excess revenue back into the electric system. Keeping the lights on. Recruiting new industry. Educating the leaders of tomorrow. Electric co-ops take seriously our responsibility to improve lives in our communities. Download Tennessee electric cooperative b-roll by clicking the link below.